My prior comments on Lupercalia and Etruscans bring up an interesting potential wanderword in Italy. While some mentally ill surfers enjoy preying on random bloggers with the bait of aimless opinions and fake interest to lead one's readers off topic, the delete button prunes away the rubbish in seconds. Another blog with a lower bar of entry can suit these persons' needs if that sort of discussion is so pressing for them. For me however, the relatively virgin topic on the origins of the Lupercalia festival and wolf themes is more satisfying. What was the Etruscan word for 'wolf'? Was an Umbrian loanword involved (and what was its word for 'wolf')? Why do so many religion-related terms from Umbrian appear to be loaned into Etruscan? Does this say something specific about the nature of early Etruscan-Umbrian relations? Did Etruscans bring these themes to Italy from Lydia? Were they organic to Italy itself? When did the aforementioned lupus/lupu pun first surface? Did the wolf-Hades theme originate with the wordplay? Or did this wordplay only accommodate a pre-existing theme perhaps? Is this Etruscan theme founded on an older Egyptian chthonic canine motif seen in Anubis? Just to scratch at the surface of this topic, some scholars would like to see an inherited Proto-IE reconstruction to account for all the European wolf terms. This certainly seems superficially well-grounded; the root *wĺ̥kʷos has a great amount of data to support it. I won't question the existence of the root either but I must contemplate: Are all the cognates truly accounted for by this reconstruction or is it simply an all too convenient way to gloss over hidden details of 1st millennium BCE cultural-linguistic interactions between Etrusco-Rhaetic peoples and the Indo-European Italic-speaking population? Germanic *wulfaz has an *f when *hw should be reflexed. Latin lupus 'wolf' is waved away as random metathesis due to taboo. An obvious Latin doublet, lupus 'wolf' and volpēs 'fox', is left unexplained. How might Greek ἀλώπηξ (alōpēx) meaning 'fox' be related? And what too about Luwian ulipna-/walipna- 'fox'? Why that unexpected -p- again? Just to let everyone know, upon request from one commenter, I've uploaded my Etruscan temple model to Google's 3d Warehouse website to share with others online. As you can see by the search listing for the query "etruscan temple", I've quickly cornered the market on Etruscan 3D paraphernalia. 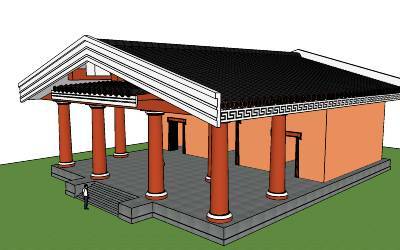 I have yet to add roof ornaments like statuettes which were typical of Roman and Etruscan temples and the reason for this is that while Sketchup is very intuitive and easy to use for architectural models, it's a little harder to create curvier objects. This means that I have to resort to another application like Blender to make them which must then be imported to Sketchup. Before I can do this however, I have to learn a lot more about Blender's interface which, when compared to Sketchup, is a LIVING NIGHTMARE!!! Despite that, one can accomplish some pretty impressive things with Blender so I struggle on in my sparetime learning the application bit by bit so that one day, maybe, I'll finally accomplish those roof ornaments on my temple. Hilarious stuff. Insecure people online or off will sometimes try to intimidate me with comments to the effect that I'd be more 'believable', 'likeable', 'respected' or some other condescending adjective if only I could get my views on the Etruscan language or those of Proto-Indo-European published in journals or books instead of wasting my time with this silly blogging thing. Usually they're just unaccomplished themselves and are projecting their life-failures onto me but the intended implication is that my lack of published journal articles is an unforgivable mark against me. 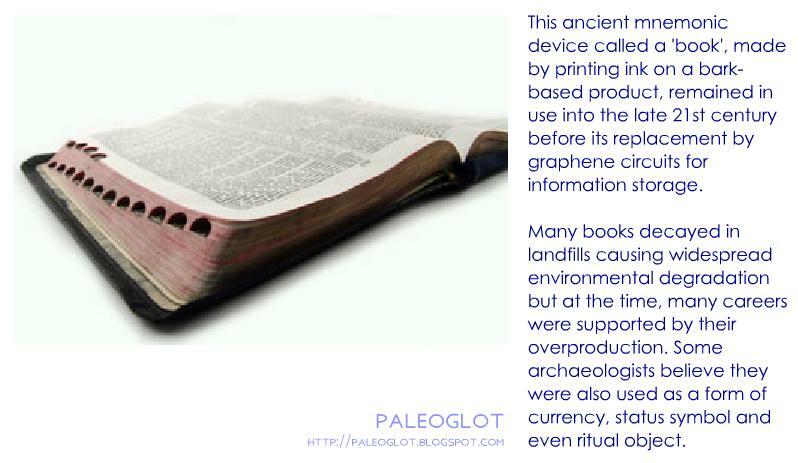 It's also implied that online publishing is secondhand publishing while the worthy people are publishing physical books with paper pages and ink, just as they did in the Middle Ages. If only I could learn to be more retro and quill my way to fame like the elite pulp polluters of society. Yet if traditional publishing had higher standards of quality, tonnes of printed gobbledeegook, everything from Zecharia Sitchin's painfully serious The 12th Planet to the intoxicated self-contradictions of the King James Bible, would never reach print. (Oops, did I just go there? Lol.) The obvious lesson here is that traditional publishing has no higher standards than online publishing. To pit one communication medium against another like this is a specious excuse for certain readers to be dismissive and mentally lazy. A related credentialist belief is that if you don't get peer-reviewed by certain academic cabals, you have no right to express an educated opinion regardless of its logical validity. These people sadly believe that only those with a boastful curriculum vitae have the authority to think and question things. Well, I've been blog-writing long enough to recognize where the future is headed, who I'm writing for and what misplaced hostility sounds like. These online predators must not have gotten the memo. So here's the memo: Are we near the end of the journal? by Nat Lang. I know this topic is sort of belated but then I do get a sick pleasure from being anti-fashionable. Over at Ancient Tides, Gregory LeFever talked about the history of Valentine's Day which is commonly known to be founded on the tradition of Lupercalia. As he points out, Lupercalia had come to take on a sadomasochistic flavour over time until those meddlesome Christians perverted it into something sterile and wholesome. What the blogger doesn't mention however is that this Roman festival was based in turn on Etruscan ritual and this is an interesting topic in itself that fails to be covered in much detail by historians. I find that historical gap quite sad and I hope you do too, fellow reader. So let's do something about that. I delight in my niche knowledge that the very name of Lupercalia was undoubtedly influenced by not only the Latin word lupus 'wolf' but by the Etruscan word lupu 'passed on, dead'. 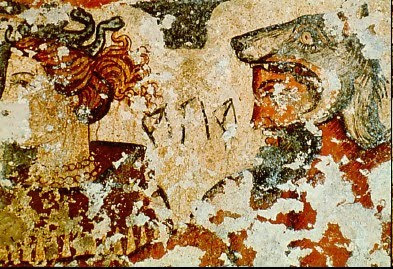 If one ever wonders why the Etruscan version of Hades wears a wolf's head as a cap as pictured below, or why the wolf came to be a symbol of the dead, now you all know. 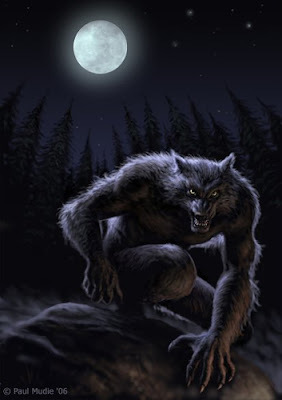 In fact, if we push the connection far enough, we might ultimately thank the Etruscans for the popular sci-fi genre of werewolves today. Werewolves are in effect men whose spirits have "crossed over" through evil magic. They become "as wolves", taking on these cultural symbols of death as the embodiments of ol' Hades himself. I can only imagine what the Etruscan term for Lupercalia was but we can at least trace this term back to Latin Lupercus, a byname of Faunus. Most Romanists, often knowing only Latin, simply take this name to mean 'He of the wolves'. Yet, in light of the Etruscan connection, might Lupercus have been fashioned instead on Etruscan *lupver, the expected animate plural form of attested lupu? A hypothetical Etruscan name *Lupverχ would literally mean 'He of the dead'. I can only speculate that this seemingly bilingual wolf-death wordplay might have had cause to arise all the more if the Etruscan word for 'wolf' happened to be loaned from Latin, perhaps *luφ or *lupe. It's hard to confirm any of this for certain, of course, but the speculation is still worth a ponder and being aware of the long, complex tradition of this festival adds depth to our understanding of history and our modern rituals. He then provides his overall interpretation. 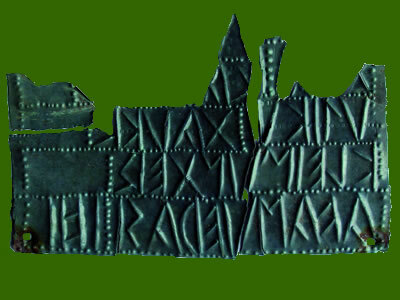 "The basic structure of the inscription is clear. It is a votive dedication to the Tluskhva divinities on the part of a woman named Kanuta, who was the wife of Aranth Pinie and a freedwoman of the Larecena family." 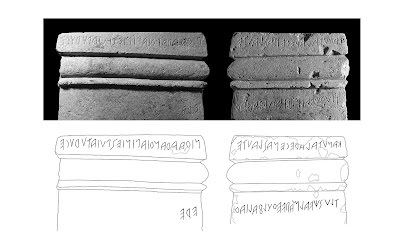 Since countless inscriptions are structured this same way, it's a cinch to read the first line: "Kanuta, freewoman of the Larecena, Aranth Pinie's wife has given ...". But the modern myth about "Tluskhva divinities" that he and other Etruscanists keep shovelling aches to be ridiculed. Before the second line can be cracked, Tlusχva must finally be confronted, competently and thoroughly. "Tlusχval is an inanimate genitive plural form (tlus-χva-l) that refers, insofar as we can determine, to a group of divinities whose spheres of activity are not particularly clear. In a talk given last year in New York City at a conference on Etruscan Myth (November 21, 2009), Adriano Maggiani reported that the word tlusχval is attested on an inscription recently recovered from Caere and he speculated that the word may refer to divinities associated with the cult of Dionysius[sic]. Even so it is disturbing that divinities are inanimate in gender given that the word for ‘god’ is an animate and takes r-plural inflection, e.g., aiser." His paradox should be all too self-evident: If the term contains an inanimate plural, it's scantly possible that it'd be used for a group of gods. So why not accept that and move forward? Why continue to insist on the improbable? And the fact that an entire conference of historians was held on these subjects with nothing resolved makes it sound like its participants were just there for the buffet. The solution is so simple: Tlusχva is a label for a single god referring to a pluralized inanimate concept. This is what its grammar is telling us if we dare to pay attention. Consulting the Piacenza Liver where this same deity is inscribed, we find the god on the rim at a position directly opposite to that of the highest of the high, Tinia Thufal (equivalent to Roman Jupiter Fidius), representing the zenith of the day and of the year (see Paleoglot: Truth will shine forth (2)). The rim represents two dimensions at once, ie. it represents the flat horizon as well as the sun's daily path which sweeps above and below the earth. It's sensible to reason then that if Tinia Thufal symbolizes the highest point in the sky, Tlusχva contrastively must represent the deepest point of the Etruscan world-view. Hence we have our answer already: Tlusχva = 'Depths'. This is the pluralized concept we're looking for to crack this mostly artificial mystery. That wasn't hard was it? We didn't even need a conference. Sometimes it's better to be self-sufficient. So Tluschva, being representative of the watery deep, is equatable with Greek Poseidon, god of the seas, or Okeanos, the primordial ocean. As such, Adriano Maggiani would be on the right track by sensing a chthonic function through the image of Dionysus. Now we have a greater hope of cracking the meaning of the second line of the inscription in question. As per the promise of a previous post, I'll now share my own analyses of the above inscription which I transcribe in more familiar Roman letters below (nb. σ represents the M-like letter, san). Following Schumacher, Rex Wallace quotes a translation that makes me cringe a little: "Upiku dedicated (this object) to Kleimunte on behalf of Arvashuera". I suppose I find myself cringing because I know all too well how easy it is to simply assume that hard-to-analyse words are names when they're not. And here, there are far too many quirky names involved that hang in thin air and without any clear historical connection. To be fair though, the translation probably approaches the essential meaning intended by the Rhaetic dedicant. It's presumed that upiku is a name yet others consider it a noun referring to a religious offering or perhaps a participle in -u meaning 'dedicated' in other contexts. Wallace then quickly classifies kleimunteis as some unknown genitive noun even though -is is normally a marker of the directive case. 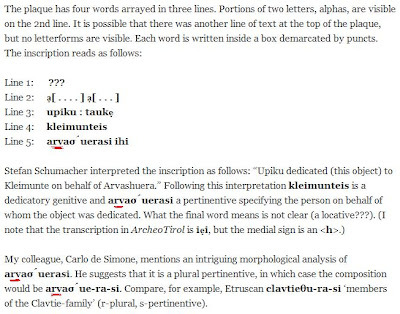 After correcting Wallace's previously mentioned transcription error, he divides avaσuerasi into avaσue-ra-si interpreting it as a "plural pertinentive". He offers little comment on the significance of the trailing word ihi. I take the first legible word, upiku, to be both a participle 'offered' and a noun meaning '(that which is) offered; an offering'. I reject Wallace's facile suggestion via Schumacher that this is a personal name. The next word, tauke, is transparently a perfective preterite verb containing the stem tau-. This stem reminds me of a presentive form tva 'shows, demonstrates' (< *taw-a) in the Etruscan inscription TLE 399, written on the back of a mirror with the depiction of Herakles suckling the breast of his mother Uni (the Etruscan equivalent of Greek Hera). So the first two words can immediately be read as '[someone] has presented (tauke) an offering (upiku)'. In grappling with the next problematic item, kleimunteis, Wallace may have overlooked a possible preposed locative demonstrative klei followed by a noun marked with two case suffixes as per the rules of Suffixaufnahme. This way, it might be read klei mun=te-is 'to [that] in this plot' (cf. Etruscan cle 'at this', muni 'plot', -θi 'in', and -is 'to, towards'). 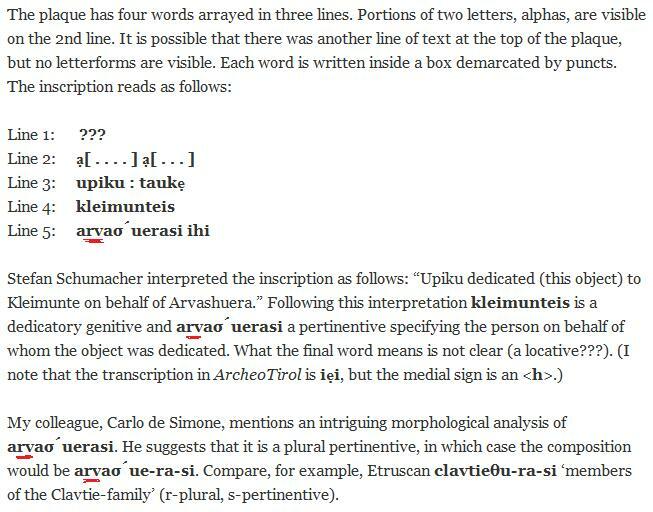 The next line starts with avaσuerasi which is certainly an animate plural in -er (< -ar) with case marker -asi 'for, on behalf of'. This implies an unmarked noun *avaσu which strongly looks to me like a transitive particle in -u of a stative verb in -as- built on a basic verbal root *au. In fact, I've been predicting this verb's existence for a while based on Etruscan avil 'year', seemingly derived from this same verb with common noun formative -il. If *au meant 'to pass on' or 'to depart', avil would literally mean 'that which passes', hence a period of time or 'year', while avaσuerasi would be a reference to 'the departed ones', ie. the ancestral dead. After this, ihi is a cinch to crack when set beside Etruscan ei 'here, there', a locative particle with general dexis. Unfortunately this word is all too often mistranslated as a negative particle leading to much confusion. When I put all this together, the following translation emerges from the fragmented inscription: "[Someone] has presented an offering to that in the plot on behalf of the departed here." The photo shows clearly the proper reading in the last line (read right to left below): avaσuerasi (σ = san, a plain /s/, while s = sigma, pronounced /ʃ/). No 'r' there anywhere. The mistake can't be a keyboard-related typo either. How might a published Etruscanist manage to analyse an inscription without ever looking at the photo immediately available to him? It doesn't seem like just the usual careless faux-pas. But then perhaps he just switched to decaf. (Arrrggh!! The dreaded decaf! Oh how I hate thee!) At any rate, in a following post I'll discuss my own thoughts on its meaning using a more accurate transcription. When reading the article Pompeii skeletons reveal secrets of Roman family life on the BBC website and the part about the diet of the poor, we're told that the diet may not have been so impoverished as one might assume. This reminds me a lot of the theory of the original affluent society. Despite some criticisms against the idea of a relatively more leisurely ancient lifestyle in comparison to our hectic modern environment, one can hardly pretend that the excessive modern urbanization that we now have hasn't led to a large segment of our population being all too dependent on other entities to handle food gathering and production, sometimes to the point of crippling dependence. Afterall, how many of us city-folk pick our own berries, fish our own trout or grow our own radishes? Most have lost this ancient knowledge. We most often go to grocery stores and buy the items we need. Yet we can't do this without first earning monetary tokens from someone else. We therefore struggle in dead-end, highly demanding, even mentally or physically toxic jobs just to acquire the means to obtain food and shelter. Our complete inter-reliance on apathetic strangers through a multi-layered economic system for even the most basic necessities is somewhat unique to modernity. And it's precisely our lack of personal autonomy in so many ways that makes us, in a manner of speaking, "less wealthy" than even our Roman antecedents. We shouldn't feign too much shock at the notion that the poor in ancient times may have had a healthier diet than what we're capable of or are willing to supply our most vulnerable population despite all our showy technology and superficial symbols. The name Ἑκάτη (Hekátē) is so often claimed to mean 'far(-darter)' presumably based on the feminine form of ἕκατος 'far' (hékatos) but I find myself starting to question this because this title really doesn't get to the heart of her fundamental nature. It's merely the obscure being explained with the obscure. It begs the question: Why 'far-darter'? And this leads to long tales about her Artemesian arrows which only beg further questions about how all these metaphors and concepts were mashed together like this in the first place. One thing is certain though. Where religious beliefs are involved, we must expect poetic creativity to have superceded literal reality. 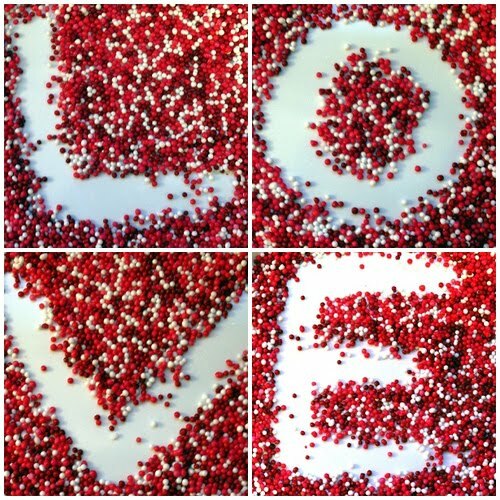 Any religious etymologies will unavoidably be quite meaningful, artful and multilayered. They may even transcend individual cultures and languages. A conservative approach remains important but we can't be stunted either. 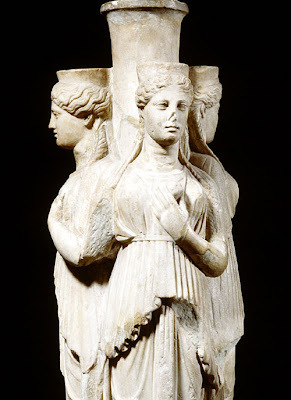 However if it's already suggested that Hecate may be of non-Greek origin, are there important foreign connections that we're missing? I've recently noticed how similar Hecate is to an Etruscan goddess by the name of Catha. I reason that Catha must have literally meant 'She of Abundance' (< *caθ 'to be full, to be abundant' + -θa [feminine]), a name designed simultaneously to allude to the bounty of the earth and to the abundant appearance of the full moon. The Piacenza Liver and the contents of TLE 131 (Laris Pulena's sarcophagus) show that Catha sits beside the lord of the underworld Pacha (aka Bacchus, Fufluns) as consort. 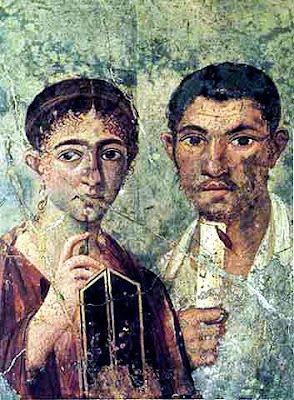 As such the pair are equivalent to the Greek xenologisms Aita and Phersipnai (Hades and Persephone). So Catha is a goddess of earthly abundance and associated with the underworld, much like Hecate (as well as like Egyptian Isis). The similarity in name between Catha and Hecate only makes me ponder further about an unexplored link. Popular Etruscanists like Larissa Bonfante, Jean-René Janot and Nancy de Grummond all continue to misinform us that Catha was a sun goddess based only on contrived comparisons like Martianus Capella's obscure philosophical poetry of 400 AD and Dioscerides' equation of the Etruscan floral term *cauθa 'chamomile' with a Latin idiom 'eye of the sun'; see De Grummond/Simon, The religion of the Etruscans (2006), p.11 and Chapin, Charis: Essays in honor of Sara A. Immerwahr (2004), p.361 . This is pretentious erudition which deceitfully avoids examining Etruscan material in perverse favour of secondhand Roman sources which aren't even of the period in question.